OnStar plans to let third party developers create new apps for their devices. OnStar announced Sunday that it will open up its ATOMS cloud platform to selected third-party developers in early 2012. OnStar, known for its subscription-based in-vehicle communications services, operates its Advanced Telematics Operating System (ATOMS). ATOMS is a cloud platform that helps OnStar connect to its 6 million customers and bring them services such as turn-by-turn navigation. Now third-party developers will be able to develop applications for the OnStar ATOMS cloud platform using the company's API, which will be released in the spring of 2012. The company hopes that opening up its platform to third-party developers will allow them to broaden their portfolio beyond just emergency communications services and navigation (though OnStar provides other services, such as hands-free calls, navigation is what most customers know them for). OnStar also revealed its first third-party API user of the ATOMS platform on Sunday: RelayRides. 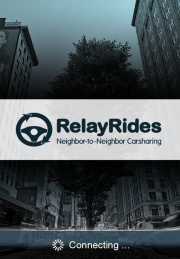 RelayRides is a "peer-to-peer vehicle-sharing marketplace." RelayRides is a network that connects idle cars (cars that their owners aren't using while they’re at work for instance) to people who need cars for small amounts of time. It's sort of like ZipCar, but with individually-owned vehicles. With RelayRides if you own a car, but you don't use it all the time--and you want to make some extra money--you can rent it out to people who don't have cars but occasionally need to use them. You go onto RelayRides and set your price (from $5/hour) and the times when you won’t need your car. Then, someone who needs a car for a couple hours or even a day can log on and rent your car at your set price, take it out for a spin, and, if everything goes well, return it back in one piece (all renters are screened for driver safety before they can rent). If something does happen to your vehicle, RelayRides offers a $1 million insurance policy on your car. RelayRides will also partner with OnStar and GM to add more security to the process. Using the ATOMS platform, RelayRides will let renters unlock the to-be-rented car with their smartphone. That way you don't also have to hand-off the key fob and worry about the renter and your keys. So far the app offerings are a little sparse. Because OnStar wants to keep its reputation as a company that highly values auto safety intact, it will only be releasing its API to selected developers. "We want to give people 1,001 reasons to keep their OnStar subscription active," said OnStar CIO Eric Litt. "We feel that opening up our proprietary API to developers will ensure that OnStar continues to keep customers connected in ways they never thought possible." OnStar may have realized that Ford, Chevrolet, and others want to get on-board with in-vehicle communications systems, and it seems determined to be one step ahead.